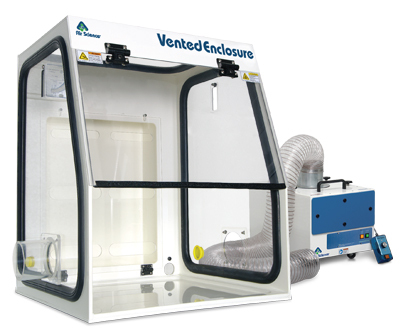 Vented Enclosures™ provide effective containment of airborne particulates during manipulation and transfer of potent compounds. Our in-house research suggests that even slight modifications of enclosures can result in containment factors from the microgram down to the nanogram. Our turbulent-free design utilizes environmentally friendly, ductless technology in combination with carbon / HEPA filtration to provide precise, safe containment in all applications. Ductless technology also makes installation of dedicated workstations easy, as no additional HVAC design is required. 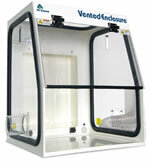 We offer a host of vented enclosures to meet every analytical need. Our Vented Enclosures are available in 8 standard sizes, in metal, stainless steel, or polypropylene construction, totaling 24 standard models. Increase operator safety by trapping potent powders at the nanogram level. Multiplex filter broadens range of filtration applications and utilizes “bag out” HEPA filtration system. No HVAC tie-in requirements, decreasing energy load and increasing installation possibilities. Available in custom sizes to fit a wide range of application needs. Accessories include an optional base stand, airflow meter, and cable ports. A. Filtration: Available with extended life HEPA filtration systems, in conjunction with Multiplex filtration. Our HEPA filters are fitted with a “bag-out” system to completely protect operators during filter changes. B. Hose: Each unit is provided with an 8 ft. PVC heavy-walled flex hose with smooth inner surfaces to minimize pressure drop and friction loss. C. Air Velometer: An analog air velocity meter in the field of vision of the user provides independent backup to the electronic airflow alarm. D. Single Hinged Front Sash: Hinged Front Sash-Allows full access to the work area. E. Turbulent Free Design: Our enclosure designs provide a smooth transition of airflow into the enclosure, with the air pulled across the work surface in a uniform, horizontal pattern, reducing the rolling effect found in conventional vented enclosures. F. Pass Through Ports: Electrical cords and cables are safely routed into the cabinet through pass through ports; located only on the side panels. G. Plenum-Slotted Baffle: Produces a horizontal airflow pattern in the work area. Baffle can be lowered for cleaning. A 4" OD exhaust port is provided to connect to ductwork or fume extractor. 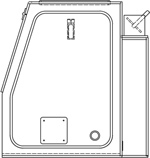 H. Clear Side Panels: Clear side panels with waste chute allow for disposal bags to be connected and prevent contamination to the surrounding lab. I. Stand: Optional mobile cart with locking casters. Flexible Design: We offer flexible solutions for any analytical operation. 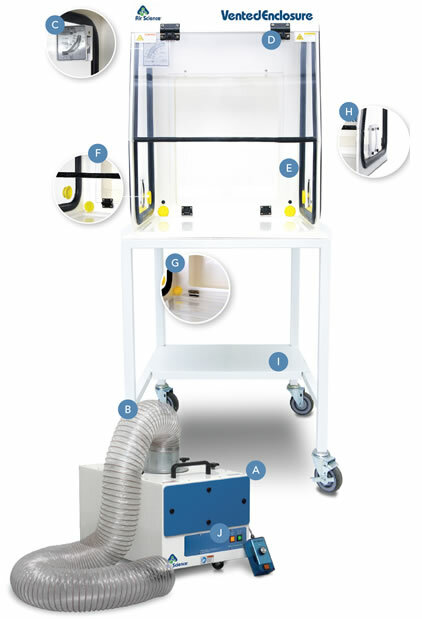 Our ventless enclosures can be plumbed into an existing HVAC setup or incorporated with our Fume Extractor to minimize upfront workstation construction costs. Standards Compliant: Performance specifications and construction meet or exceed OSHA, ANSI and relevant international standards to assure operator safety. 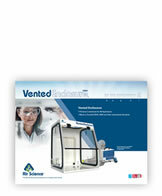 Validated Performance: Safebridge Consultants have verified and confirmed performance of Air Science Vented Enclosures in controlling airborne concentrations of particulate powder.